TO THE NEW has been recognized by AWS as a certified AWS Public Sector Partner. 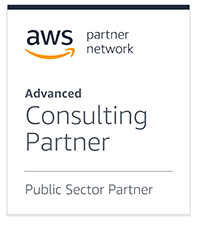 AWS runs several competency programs to identify consulting and technology partners across the world with deep industry experience and expertise. The AWS Public Sector Partner Program aims at identifying service providers who demonstrate strong experience and capabilities in the public domain. TO THE NEW has achieved this recognition after due evaluation and claims of multiple projects in the government, NGOs & Education sectors. We have demonstrated significant capabilities to design, architect, migrate, deploy, and manage complex cloud architectures on AWS. TO THE NEW is an AWS Advanced Consulting partner with more than a decade of experience on AWS Cloud managing mission critical applications. We have attained several badges that validate their capabilities in DevOps, Managed Services, Big Data and Cloud. We also have a strong team of AWS Accredited Architects and DevOps Experts who have managed more than 200 Cloud Implementations.